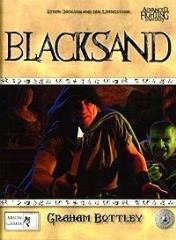 The ancient and deadly city of Port Blacksand is a veritable nest of thieves, pirates, and other undesirables. Despite this, or even because of this, the city is a magnet for adventurers looking for fame, glory, and treasure—and a few find what they are looking for. An essential sourcebook for any city-based Advanced Fighting Fantasy game, Blacksand contains a full guide to the city, its inhabitants and landmarks with all-new maps, completewith a gazetteer detailing districts, major organizations, personalities, and adventure hooks.